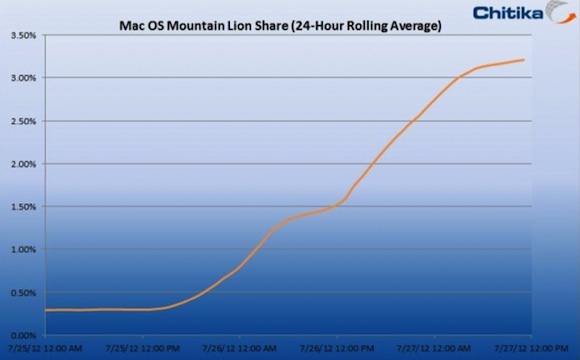 AllThingsD reports that just over 48 hours after launch, OS X Mountain Lion is already accounting for over 3% of web traffic coming from the Mac platform. The data, which comes from analytics firm Chitika, shows that Mountain Lion's share has risen quickly from roughly 0.25% prior to the public launch. Adoption has been even faster among those who closely follow Apple news, with 9to5Mac reporting yesterday that over half of its Mac visitors were already on Mountain Lion after hitting 10% even before the public launch. Last year, Apple touted one million downloads of OS X Lion in the first day of availability, but the company has yet to release any official early figures for OS X Mountain Lion. With Apple having just released new and updated models of its popular MacBook Pro and MacBook Air machines last month, many users are eligible for Apple's Up-to-Date program, which offers a free upgrade to Mountain Lion. Apple has, however, been experiencing some issues with the program, with a number of users only just now receiving redemption codes to allow them to download OS X Mountain Lion. Every day I find another reason to remember why the down-vote buttons were actually a really good idea. ...which means 97% isn't coming from ML. Doesn't sound like a triumph to me. I could be part of that traffic too if those bumholes would only send my upgrade code! So, what you're saying is that if the DAY AFTER Windows 8 comes out, if less than 37.5 million people have installed and are running Windows 8, it's a failure? I see. I'll compile the stats for you on October 27, 2012, the day after Windows 8 is released. no way in hell i would risk computer downtime just so i could be "first" to download. i mean, there really is no rush. You do realise that your .1 update is 'bugfree' because of all the 'idiots' that jump at the .0 release, right? How do they get these statistics? I'm no mathmagician, but I think it is safe to say that with the relative ease of upgrading and the low price point, Mountain Lion will be an extremely successful rollout for Apple. We'll get more official numbers from Tim Cook in September or October during the iPhone keynote. Sure it is. Windows XP still has useful life, it is on extended support and gets security updates and is a modern, multi-user operating system with good design based on enterprise features like filesystem ACLs, proper kernel/user space seperation, a modern filesystem, etc.. etc.. Meanwhile, OS 9 was rather poor already when it shipped, even more so 10 years after its last update, it didn't even a proper process scheduler, relying on cooperative multi-tasking, lacked true multi-user support, filesystem security, etc.. The comparison is completely bunk. Running Windows XP in 2012 is not like running Mac OS 9 in 2010. Not even near at all.